This set is called “Friendly Bunch” – I think it’s actually cherry blossoms! But as artists we can color things any way we want, right? 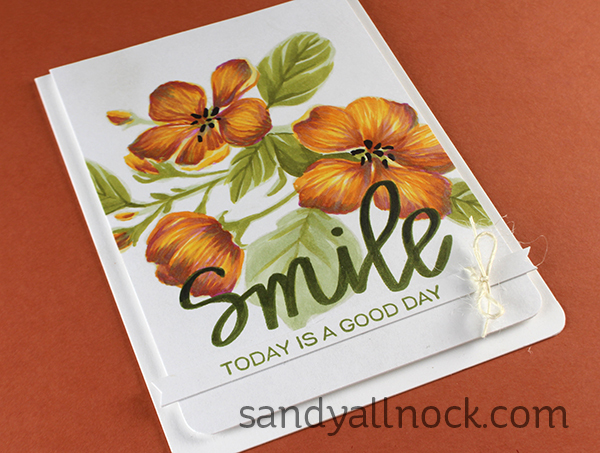 I turned these into a pretty little bunch of orange flowers, and made it a no-line piece as well – meaning I stamped the image with a superlight ink (it’s a near-dead tan pad that I keep around just for this purpose!) Watch the video below or click HERE to see it in HD on YouTube. Since I had stamped my secondary sentiment off-center, and was too lazy to restamp it, I just added a little twine feature to one side so it looked like it was on purpose. Shhhh don’t tell on me! I really loved how this one came out….so fresh and pretty! 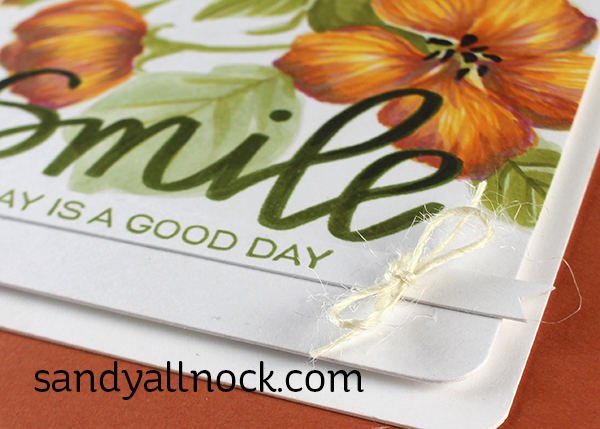 The card front is trimmed down to allow 3 sides to have a white border, and it’s popped up on dimensional adhesive. Happy that you do let us in on how to FIX off center, etc…..worked so well and even added more interest! Love what you colored!!! TFS Sandy! Thank you for all the fab advise on flowers & leaves. Gorgeous & very very much needed here with me. I too am not fond of colouring flowers but for a different reason to you, I can’t ! I do own lots of stamps of flowers but they are my nemesis. Have a great week whatever you find yourself doing, & till on the next floral card. Whaaaat?? RV and V for shadows on a YR/Y flower!? Never would have dreamed it. Even looking at it finished, I wouldn’t have guessed it. 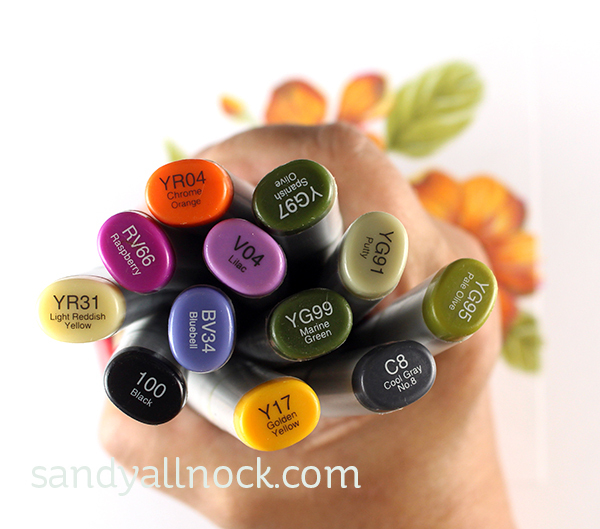 Love watching how your artist eye breaks out of the natural blending families! Looks great! Thanks for your inspiration and talent insight it’s great to hear you explain why you colour the way you do it helps so much. 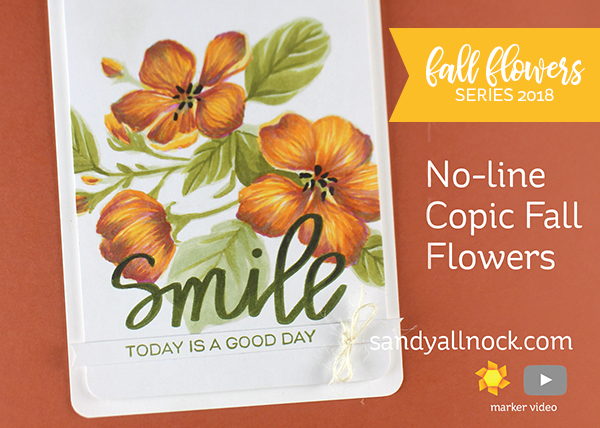 I love colouring flowers Sandy and I am over the moon with your colouring flowers this week! Thank you so much. This, as with EVERYTHING, you do is a true work of art! It’s absolutely gorgeous!! If I may ask, what do you do with your cards featured in your videos? Love your card and thank you for your video. I love watching you create. Awesome coloring! Thanks for the video, loved how you “fixed” the off set sentiment! I also have many sets of flower stamps and don’t use them as often as I should. Thanks for the motivation to get to them in the fall my favorite season. I think dogwood flowers have 4 petals and perhaps that stamp is an apple blossom. Doesn’t really matter though. You made it beautiful and just created your own flower species! Love how you’ve achieved the pretty autumn colour of your flowers. I actually remembered your tip to use purple to add darkness to my little MFT fox for the card I created (and posted) this weekend.